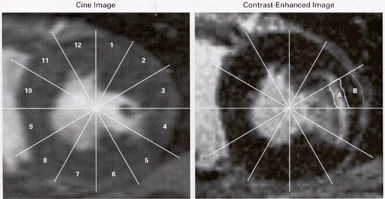 Typical CineImage and Contrast-Enhanced Image Obtained by MRI before Revascularization. Twelve equal circumferential segments wer analysed in each short axis view. For contrast-enhanced, the transmural extent of hyperenhancement was determined for each segment with the use of the following equation:percentage of area that was hyperenhanced=100x area A divided by(area A+areaB). Reference:R.Kim and others.The New England Journal of Medicine, Vol.343, Nov.16,2000, No.20,Pp.1445-1453.